Kaizen is a japanese word from the fusion of kai and zen. Its meaning is ‘continuous improvement’ and you can apply it to any field: management, sports, personal development, etc. There is no success without a kaizen attitude. Next, it will be explained how to develop this habit. 1. Setting ongoing targets at any age. Having challenges is the gateway to emotions and creativity. If you wish your corporation become a learning organization, you should align the goals of your employees towards a common vision. The book 8th Habit, by Stephen Covey, is about this issue. We need to create milestones and tools to check whether our corporation is on the right track. According to Mike Rother is his last book Toyota Kata, the difference between Toyota and the rest of worldwide companies is the behavior and conduct of their employees. Kata in Japanese has the meaning of a routine. You can read an essay written by Rother and Liker entitled “Why Lean Programs fail” in the articles link. Challenges require motivation, discipline and willpower. Everyone has to wonder if the goals set by your superior are in line with your character and talents. If the answer is negative, then willpower will be sacrifice. There are two different approaches to this topic: the Japanese term munozukory (trusting in people and their capacity to achieve excellence) and Jim Collins´ approach (the right people in the right seat). The following aphorism remind us the importance of failing to learn: “It is only from the experience of challenging ourselves that we learn and grow, and we often develop and mature much more from our failures than from our successes. Moreover, when we put ourselves on the line, when we fall down and get up again, we become stronger and more resilient” Tal Ben-Shahar, Harvard professor of Positive Psychology, one of the most popular classes in the history of university. In summary, what matters is the attitude after a failure. Collins would say that you need ‘winners’ in your company, people with trust and self-esteem. There is a quote of Covey and others writers widely- used in Lean approaches ‘Learning by doing’. It´s the essence of Deming´s Cycle. Mistakes are to learn and seek solutions. They are opportunities to improve, but many times we waste time and energy blaming ourselves or others. Humility is also important- to recognize our faults and be aware that our actions sometimes create problems. This attitude is called hansei (reflection) in Japanese. If you consider that it is difficult to see the glass half full, don´t worry; you can develop cognitive skills and you will learn to be optimistic and change will be permanent. It´s the field of Positive Psychology. Automatic responses in front of events should be questioned and new interpretations should be created. Change your thoughts and you will have new emotions. In summary, when something bad happens; you must develop optimism to focus in solutions, skills to find them, and willpower to achieve them. Writing questions promotes that unconscious mind seeks answers. A piece of paper and a pen or a smartphone are very useful. A consequence of kaizen behavior is flexibility. We should be resilient enough to rebound quickly from our mistakes and setbacks. In addition, the world is changing fast and we should move with it. This idea is not only applied to human beings, but to corporations, too. Both are systems. You cannot go fast and survive without flexibility in the long run. In the manufacturing sector, Autonomous Work Groups are good instances of being flexible. A good foreman will be surrounded by a similar team with experience with formworks, rebars and other tasks so as to resolve the daily setbacks on site. A good start to become a learning corporation is to begin with a little group. Later, you can spread it to the rest of the company and suppliers. In the construction industry, a project would be a good beginning: site contractor staff, and later, workers and subcontractors. Last Planner System is a good tool to create the right environment to develop a kaizen culture. Next figure is a neuron and it will serve to explain the concept of myelin and its influence in learning, according to the research of the neurologist Bartzokis. Myelin acts as an insulation electrochemical. 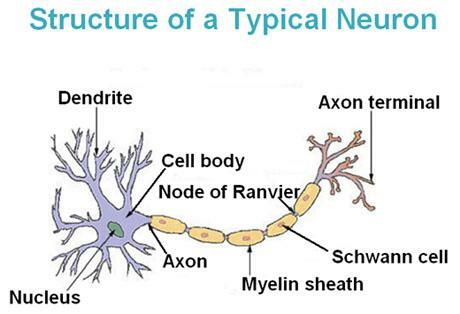 It´s produced by Schwann cells and is responsible for the transmission of nerve impulses.The Nodes of Ranvier are non-myelinated areas and allow the leaps of the nerve impulse. Need produces the inflammation of the axon terminal, Schwann cells generate myelin and swell up until they come across to the Ranvier node. In that moment, a nerve impulse occurs and the same story is repeated, jumping from one cell to another up to reach the core. This process is called myelinization. A question occurs: what are the factors that have more influence in the transmission of the information - that is to say, in the speed of myelinization? They are two or three depending on your point of view: need and frequency. Our behaviors are conditioned by two basics needs: survive and pleasure. According to the theory of Palo Alto, pleasure is often satisfied with happiness. In summary, if we wish to be skilled at something, the three ingredients are: need, emotion and frequency. (For more details, please consult the book by Dan Coyle, The Talent Code).